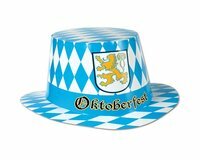 There are lots of Oktoberfest Decorations and Party Ideas at Novelties Direct. Enjoy a Bierkeller Themed Party this year and impress your guests with our choice of Oktoberfest Cutouts. 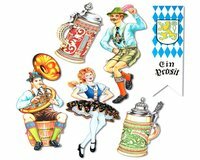 We have German Bierkeller decorations and accessories plus our Party Packs are perfect for bars, pubs and restaurants celebrating this German Beer Festival as well as for parties at home, to make ordering easy. Get together with friends and enjoy the ambiance by wearing a Bavarian Hat or beer glasses or even a beer costume increase the fun element and add to the atmosphere as you sing traditional drinking songs. Germany Flags, Table Flags as centrepieces and Black, Red & Yellow Balloons tied in bunches are a great way to feel part of this occasion. You can even wear the flag with our German Flag Face Mask. Browse through our huge range of Oktoberfest party supplies.